We have done a legal expropriation and the plaintiffs have not contested the expropriation, but the amount [of compensation]. The court did not find any illegality of the action, but has only accepted a complaint with the claim that the compensation given by the government is very low and has to be much higher. This is what the court has done. 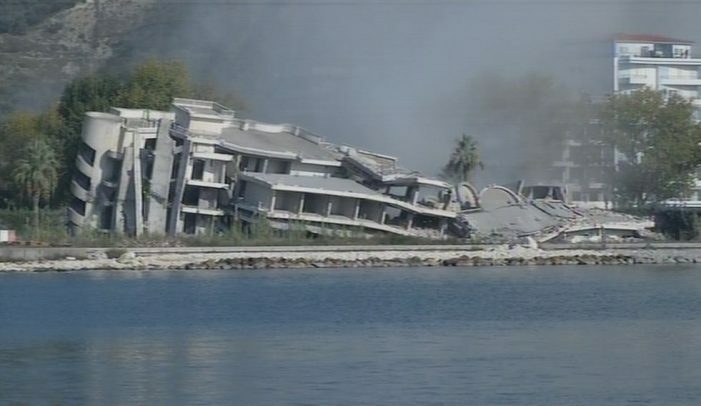 The case in question deals with the demolition of the Jon Residence along the Vlora coast. According to the court documents, the owners legally owned the land, received a building permit from the Municipality in Vlora in 2010, and the apartments and shops they built on it were legally registered at the Immovable Property Registration Office in 2012. Thus the building was legal by any standard. On October 8, 2013, the National Council for Territorial Planning (KKT), which is headed by Prime Minister Rama, decided to issue emergency measures to clean up “illegal buildings” along the coastline. The Jon Residence owners filed a claim at the Vlora Administrative District against the decision of INUK/INUV, arguing that it was “arbitrary” and infringed unlawfully on their property rights. On November 7, the court agreed with them, upon which INUK/INUV appealed at the Administrative Court of Appeal. On November 13, after the owners sent a complaint at the National Ombudsman, the latter sent a letter to State Police and Vlora police urging them to stop preventing the owners from entering their property. The Ombudsman argued that their property rights had been violated, and the INUK/INUV were acting unlawfully. In spite of the National Ombudsman’s letter and while the appeal at the Administrative Court was still in process, the Council of Minister issued a decision (VKM) on November 27 to expropriate the stretch of Vlora coast that included the Jon Residence. This was however not made immediately public. A day later, on November 28, 2013, Prime Minister Rama unveiled the EU-funded Lungomare urban renewal project along the Vlora coastline, and on December 4–8 the Jon Residence was demolished with explosives, one day after the decision of the Council of Ministers was published in the Official Gazette, and the owners were officially informed on which basis they were deprived of their lawful property. On January 20, 2014, the Administrative Court of Appeals terminated the proceedings because the Jon Residence had ceased to exist. This decision was upheld by the Administrative Court of Appeal in a verdict of May 6, 2016. Meanwhile, on December 26, 2013, the owners had lodged a claim against the VKM of November 27 at the Vlora District Court. Their claim was allowed by the court, which had been adopted in “gross procedural violations and breaches of the Expropriation Act […] and various bylaws.” The owners had not been informed about their expropriations and had not been offered the possibility to appeal the decision. The government didn’t even know who the owners of the Jon Residence were, as it only asked the Vlora Municipality for information about its owners after it had been demolished! Both the Vlora District Court and the Appeals Court decided that the owners ought to be compensated for their unlawful expropriation, thus ruling in their favor. The Court notes that the applicants did not complain to the Court of a lack of compensation for pecuniary damage for the non-enforcement of the interim order of 7 November 2013, rather that the authorities failed to enforce the interim measure, which made it impossible for them to have the merits of their case properly examined. This effectively disproves the claim of Prime Minister Rama that this case was about higher compensation for the owners. They rather went to Strasbourg because the government had blatantly ignored the decision of the Vlora Administrative District on November 7, and had continued with the demolition of the building. This verdict therefore strikes at the heart of the government’s utter disregard and contempt for the judiciary. It is a behavioral pattern that has been witnessed in many of its controversial decisions, including the appointment of the Temporary Prosecutor General, who herself in turn has violated the Constitution and the laws of Albania. Another effect of this disregard and contempt is the fact that the Rama government has failed since August 2016 to propose a new Albanian judge at the European Court of Human Rights. The implication of their inaction seems to be: better no one than someone who is not on our side. The building had been considered by the authorities to be illegal until the adoption of the District Court’s decision of 7 November 2013. After its adoption, the authorities could no longer deal with the applicants’ building as a prima facie illegal construction. However, at the site of the Jon Residence an infrastructure project in the public interest had been planned. All other buildings had been demolished solely for the implementation of that project. The Government acknowledged that there had been an interference with the applicants’ rights under Article 8 of the Convention but that interference had had a basis in law and had also pursued a legitimate aim, namely the recovery and reconstruction of the seafront of the city. The Government submitted that the applicants’ flats had been mainly summer homes and that they had not had to bear too much of a burden. In other words, even though the government knew the building was legal, and even though the District Court had ordered it to suspend the expropriation and demolition, it still issued the VKM of November 27 to expropriate the Jon Residence because “the recovery and reconstruction of the seafront of the city” would be a “legitimate aim” and the building merely contained “summer homes.” This sums up nicely the government’s steamrolling approach: urban renewal is “legitimate aim” for which all these “summer homes” need to be destroyed, irrespective of the constitutional rights of their owners. The owners of the Jon building were wealthy and well connected, and were therefore better able to move the court case through the Albanian judiciary up to the Strasbourg Court. Others, in Shkoza or Himara, are not that fortunate. They are forced to watch on as their properties are destroyed by government hiding behind urban renewal plans that are just poorly masked schemes to enrich an oligarchy founded on endless construction work. It should also be pointed out that, once again, the Delegation of the European Union in Tirana has remained completely silent on this issue. Ever hesitant to call out their favorite Albanian prime minister, they consciously and openly ignore the fact that respect for human rights, including property rights, is one of the five key priorities for the opening of the EU accession negotiations. This is all the more damning, because the EU funded the Lungomare project that formed the pretence for the destruction of the Jon Residence. With his negligent and abusive response to the recent ECtHR verdict, which will cost the Albanian taxpayers €13 million, Prime Minister Rama has shown that he understand neither the independence of judiciary, nor to respect the fundamental rights that underlie the rule of law in Albania and the EU.